Late night wake-ups when baby has a blocked nose? Every parent knows what it's like getting up in the night when your baby is having trouble breathing. Because babies can't clear mucus themselves, a stuffy, blocked nose can keep them awake through the night - and it affects their feeding too. Our Nasal Aspirator is so quick and easy to use that both you and baby will be back sleeping in comfort in no time! The round tip fits comfortably into your child's nostril no matter the size, and easily removes any mucous. Mucus is transferred into the cylinder, where it stays, so you don't have to worry about anything unpleasant reaching you! 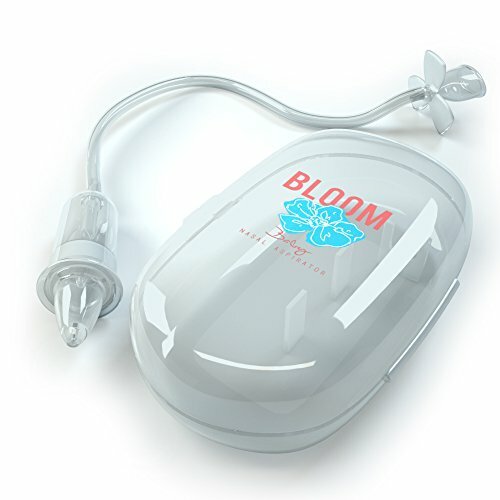 Unlike a conventional bulb or battery operated aspirator, the Bloom Baby Care aspirator makes it easy to manually control suction, giving you complete control over the comfort of your child and removal of mucous. Plus you never have to worry about spending money on replacement filters. We don't compromise on safety which is why our aspirator is made from easy to wash, medical grade (non-toxic) BPA and Phthalate free materials. With our products, your baby will be getting the safest, most comfortable experience, every time. Easy to clean with soap and warm water and safe to wash in the top rack of your dishwasher. Plus we include a compact carry case that keeps all parts clean, organized, and easy to travel with. Quality is our top priority which is why we offer a 100% no questions asked, money back guarantee. So click add to cart now and never worry about a blocked up nose again! HELP YOUR LITTLE ONE BREATH EASY AGAIN IN SECONDS - Your baby will be free of congestion in less than one minute! Our nasal aspirator is specifically designed to efficiently and effectively remove excess nasal mucous. Perfect for infants and toddlers. KEEP YOUR BABY COMFORTABLE - Thanks to our soft silicone tip, your little one stays comfortable and relaxed while the effective suction seal provides nasal relief in seconds. NO COMPROMISE ON YOUR BABY'S HEALTH. Nothing is more important than the health of our babies which is why our product is strictly medical-grade BPA FREE SILICONE and FILTER FREE. We only use the safest, highest quality materials. GREAT EXPERIENCE OR YOUR MONEY BACK! As parents, we know just what a lifesaver our product is. We are so sure that you will be 100% satisfied that we offer a full refund, any time, no questions asked! If you have any questions about this product by Bloom Baby Care, contact us by completing and submitting the form below. If you are looking for a specif part number, please include it with your message.